200 Proof Gospel.com: What's The Score? When I was a kid, I was blessed to have a family with season tickets to The California Angels. The California Angels, not the Anaheim Angels, nor the Los Angeles Angels of Anaheim, nor the Anaheim Angels of the greater California area…The California Angels. Now, I hope that we have that cleared up. Regardless, we had fantastic seats and there was a nice old guy who sat right in front of us. He was there every game, smoking his White Owl Cigars and keeping score. He was an amazing guy who brought his scorebook to EVERY game. He could tell you who did what and when going back several seasons. 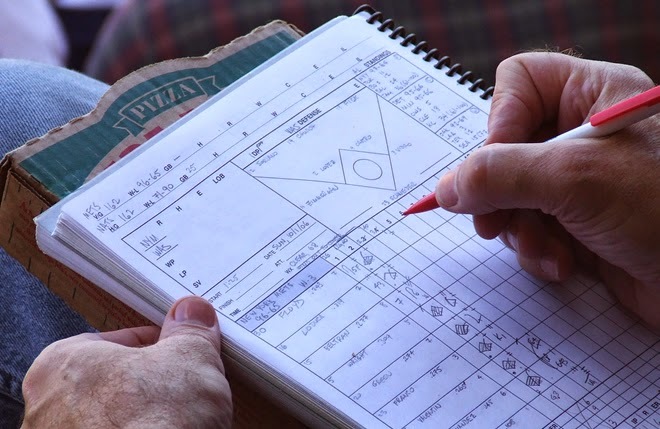 He was diligent about recording every pitch, every play, every game in his scorebook. To this day, when I smell cigar smoke, I am transported back to being 12 years old, looking over his shoulder and learning all of the symbols and abbreviations to keep score. It seems like it was just yesterday that I was cheering for the CALIFORNIA Angels (boy do I have a bone to pick there), eating hot dogs and waiting for a foul ball to fly my way… still waiting. We are all scorekeepers. We have long memories when it comes to who wronged us. We hold grudges. When we have been wronged and “that person” or “those people” don't apologize, we often feel justified in not forgiving them, after all, they never asked for forgiveness. Our memories go back many seasons and whereas the facts may be skewed over time, we know one thing – THAT PERSON HURT ME AND I WANT TO HURT HIM or HER BACK! After all, it is only fair that they should get theirs. Then there are those with tender consciences who have hurt others. The demons of their past visit them, often in the quiet hours. They continue to flog themselves, even if they have apologized to those whom they have hurt, even if those people don't even remember the event, it haunts them. The instant replay is caught in an endless loop of accusations and they live it over and over again. Thanks be to God, for the sake of Jesus Christ that, contrary to many religious notions, He doesn’t have a score book, only a Book of Life. When bad things happen, we often think that the Divine Statistician is giving us payback for something that we have done, that the score must be settled. Whereas there are natural consequences for many of our sins, like being dumped cold because you cheated on your spouse, or being punched in the nose for cheating with someone else’s spouse, God is not in the game of settling the score. The score was settled once and for all as Christ took the sins of the world onto Himself in that “Glad Exchange” (www.200proofgospel.com/2015/03/its-not-fair-glad-exchange.html). He atoned for all of your sins there on the cross and He threw the scorebook into the pit of Hell. The baptized are wiped clean, coated in Christ and now utterly blameless because the One who created the Heavens and the Earth in six days, who rested on the seventh, has recreated you on the 8th day. If God no longer remembers your sin, why should you? Furthermore if God no longer remembers the sins of another, why should you? After all, you can relax knowing that He always gets the last word, and that word will be spoken on Judgment day. For those who are in Christ, the verdict is always – not guilty. who satisfies you with good so that your youth is renewed like the eagle's. Bless the LORD, all his hosts, his ministers, who do his will! By the way - the song went "CALIFORNIA ANGELS A-Okay!" Los Angeles Angels of Anaheim - Phooey ! They're in Orange County, not Los Angeles!